Do you want to send emails that look like this to curated lists of interested customers, clients or social networks? Of course you do! Well designed email campaigns can drive business, motivate action, and create community, to name a few. Above is an example of an email that I created for Clinical Trials Transformation Initiative (CTTI). As CTTI’s Communications Director, I built their strategic email communications portfolio from the ground up. 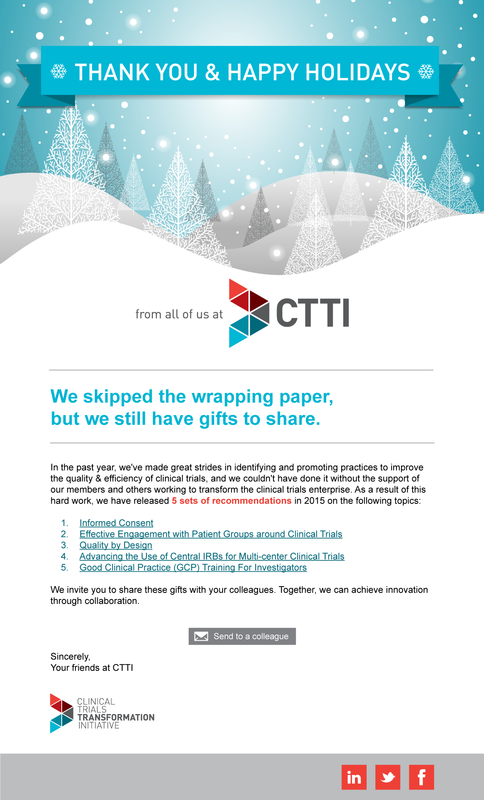 Within 2 years, we had >5,000 self-elected email recipients receiving beautifully designed emails, most of which packaged the organization’s recommendations for improving the clinical research enterprise. In 2016, our email campaigns contributed to the >32,000 downloads of those recommendations.